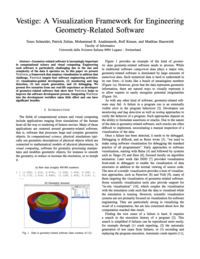 Geometry-related software is increasingly important in computational science and visual computing. Engineering such software is particularly challenging due to the size and complexity of the data it operates on. In this paper we present Vestige, a framework that employs visualization to address that challenge. Vestige targets four software engineering activities: (1) visualization-guided development, (2) monitoring and bug detection, (3) test oracle generation, and (4) debugging. We present five scenarios from our real-life experience as developers of geometry-related software that show how Vestige helps to improve the software development process. Integrating Vestige into the development workflow takes little effort and can have significant benefits.